Introducing the second in a new pattern line….one that comes with a story attached! The new Yarn Spinner Story + Pattern line allows readers who knit (or knitters who read) two pleasures at once. Enjoy a piece of short fiction, accompanied by a pattern that stands on its own. This downloadable luxury offers a sweet combination for thinking knitters, particularly ones using a tablet or smartphone. For safety reasons, Officer Anne McGeehee, aka Mother Earth, can’t wear a cowl in her line of work. (Secretly, she’s always wanted to knit one.) 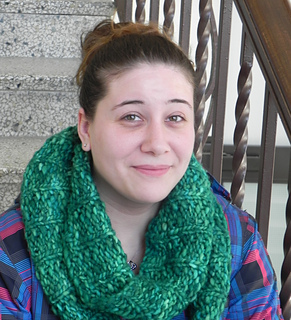 After averting disaster on a commuter train, Anne and a new young friend bond over knitting. Indulging her urge to try out super bulky hand-dyed Merino and big needles, Anne makes the cowl style everyone’s wearing on the commuter trains as a gift for her young friend. Newly relocated to New England and its cold, snowy winters, she’ll need it. 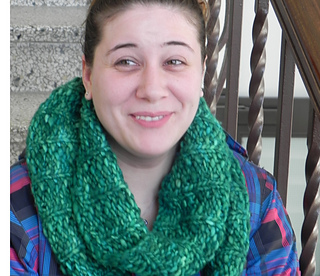 This luxurious, large, reversible cowl pairs style and function. 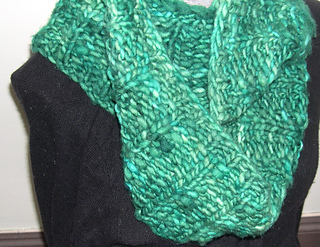 Snuggle right in, wrap it twice or even three times around your neck, look good, and stay warm. Better yet, it’s a fast project in the round on size 15 (10mm) needles at 2.5 stitches per inch, using approximately 186 yards/170 meters of super bulky yarn (or more for an even bigger cowl). It’s a great opportunity to try out a textured pattern. This is ideal for an advanced beginner; you’ll grow through following the stitch pattern, but it’s nothing more than knits and purls. 10 sts = 4” (10cm) with size 15 (10mm) circular needles, or size to get gauge. Approximately 186 yards/170 meters of super bulky yarn that knits to gauge. For a cowl wider than 7”/18cm, you’ll need more yarn.